In 1888, the Star newspaper reported: ‘Whitchurch is in Hampshire. People who live IN it call it a town. People who live OUT of it call it a village. It is about as big as a good-sized pocket handkerchief. It has three shops and 19 public houses’. Today Whitchurch is still the smallest town in Hampshire, with rather less pubs, but a few more shops and a story to tell…. 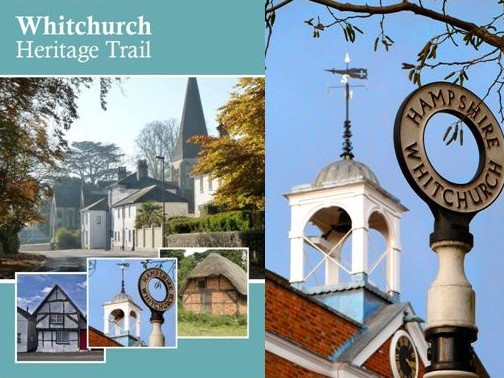 Much of the town centre is a conservation area and the Heritage Trail takes you on an easy two mile walk passing many of the surviving historic buildings and points of interest along the way. You will read about a notorious highwayman, famous authors, conflict and a first for the BBC! Historically always punching above it’s weight, did you know that it was Whitchurch folk that won the Right to Peaceful Protest for the country? Local community groups Stowey Walking and Stowey Green Spaces join forces to make walking safe for all. 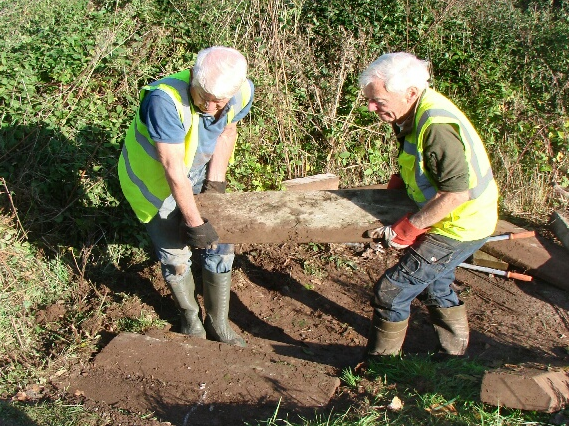 Some-time ago a flight of steps was unearthed on the northern side of the A39 between Nether Stowey and Inwood Farm .Recently more residents and visitors have been using the old A39 to get to the farm shop and café and to events at Quantock Lakes. Stowey Walking wanted to encourage people to walk between the village and Inwood Farm/Quantock Lakes but were concerned that the path was badly sign-posted and the flight of steps was unsafe to use. Stowey Walking liaised with the Rights of Way Team at Somerset County Council and the landowner and the route is now well way-marked for pedestrians with some ‘slow down’ signs on the road. Stowey Walking then got together with Stowey Green Spaces to work on a plan to repair the flight of steps themselves without having to rely on the stretched resources at Somerset County Council. Once they had obtained a S171 Order from the Highways Department to carry out work adjacent to the highway,they arranged for a small working party from Stowey Walking and Stowey Green Spaces to repair the steps. Fortunately it was a sunny October morning and with a bit of muscle power the old steps were soon removed and a new flight assembled next to the footpath signpost. They hope that local residents and visitors will take the opportunity to leave their cars and walk from Nether Stowey to Quantock Lakes occasionally and perhaps walk on to the neighbouring village of Fiddington. For details of local walks around Nether Stowey and Over Stowey see www.stoweywalking.co.uk , copies are also available in the village at Nether Stowey Library, the Post Office and Parish Council Office. The centenary celebration of women’s franchise was an excellent reason for Wiveliscombe to celebrate with a special walk. 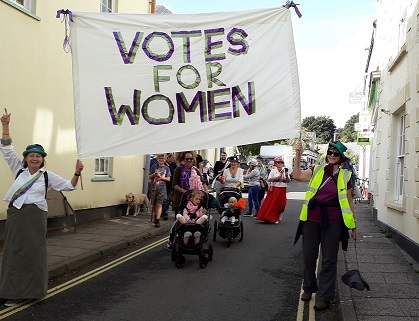 The group, many dressed as suffragettes in their colours of purple, green, red and white, marched through the town to the square singing the suffragette anthem and continued through the Town and into the countryside. Long skirts were hitched up, hills surrounding Wiveliscombe climbed and the group finally gathered in the local hostelry. 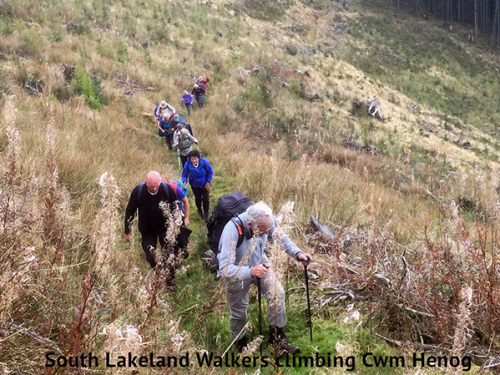 On the weekend of September 29th to 30th a large group of South Lakeland Walkers visited Llanwrtyd Wells. 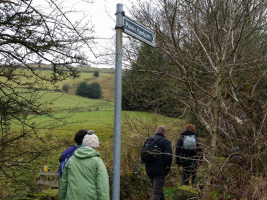 On the Saturday the walkers split into various groups to walk in the Brecon Beacons and more locally in the Irfon forest. On the Sunday Martin Pigott (Llanwrtyd Wells Walkers are Welcome Secretary) guided 18 walkers on a 10-mile walk up Cwm Henog, then the White Bridge on the Abergwesyn Road, and back to Llanwrtyd following the River Irfon. Near to Llanwrtyd the walkers visited the Victorian Dolycoed Well but no one was brave enough to drink the sulphur water. The walkers thoroughly enjoyed their weekend away from the Lakes in the peace and solitude of the Cambrian mountains. Dereham Walkers are Welcome and The Ramblers (Norfolk) welcome the confirmation of the establishment as rights of way of 6 routes in Dereham, as reported by the Dereham Times and EDP recently. The six routes all lie to the east of Dereham, and are already mostly well established tracks used by farmers and residents in the area, as well as members of the public. This decision now means that all of the routes will be recognised as Restricted Byways, giving the public a legal right to use them. Restricted Byways can be used for walking, cycling, horse riding and carriage driving (ie with a horse and cart). The public cannot use a restricted byway in a mechanically propelled vehicle such as a motorbike or a car. Our congratulations go to Dereham Town Council, which initiated the process and made the claims, more than 2 years ago. Throughout the process, the Town Council has been supported by The Ramblers (which provided much evidence and comment) and Dereham Walkers are Welcome. The claims, supported by reference to historic records and statements from people who had used the routes over a period of more than 20 years, have progressed through the legal processes needed to evaluate them, resulting in the recent decision. In accordance with the usual procedures for such matters, the decision was made by Heidi Cruickshank of the Planning Inspectorate. Ken Hawkins, Chair of Dereham Walkers are Welcome added that this will take the number of public rights of way in the town to 41. 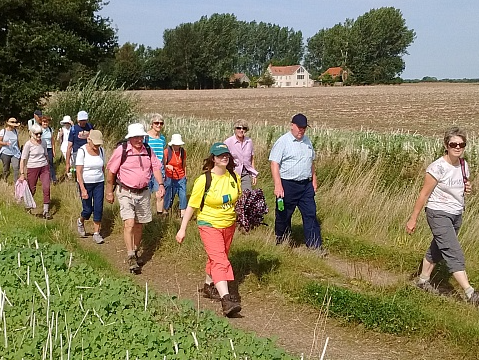 In order to celebrate these valuable additions to our rights of way network, Dereham Walkers are Welcome arranged a 6½ mile ‘New Routes’ walk on Monday 27 August. This walk explored all of the routes now recognised. 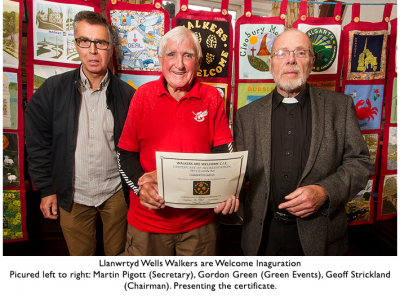 On the 27th August, 2018 Llanwrtyd Wells Walkers are Welcome celebrated their WAW official membership with an inauguration ceremony at the Neuadd Arms Hotel at the centre of Llanwrtyd Wells. In a packed room there were speeches from Martin Pigott (Secretary), Gordon Green (MBE and founder of Green Events), Geoff Strickland (Chairman) and the Mayor, Lynda Pace-Avery. After the speeches, champagne and canapes were served. The community of Llanwrtyd Wells and the Town Council have provided strong support for WAW submission and this was reflected in the good turn-out. The WAW wall hanging was hung in the presentation room and this provided an excellent and creative backdrop to the proceedings. Snaith Walkers Are Welcome launched a new Family Walks Leaflet on July 19th at Snaith Primary School. The front cover was designed by a pupil from the school. 185 children from Snaith and Cowick schools submitted entries and we chose 10 finalists who all received an I Spy Countryside Book. 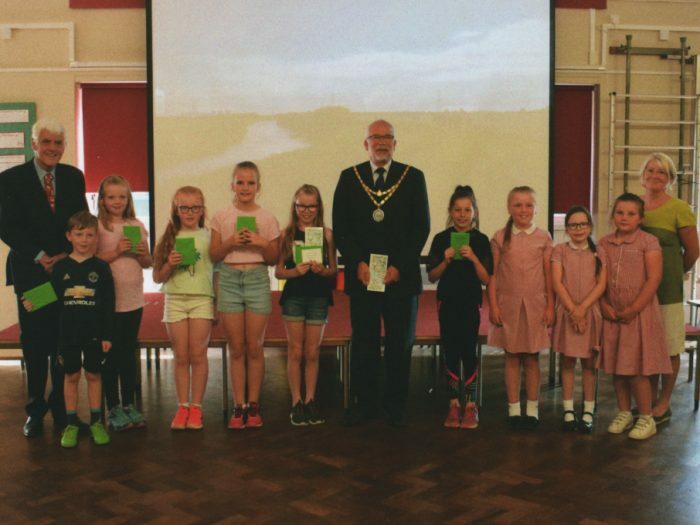 The winner was presented with a book token for £25 from The Town Mayor. The leaflet, that details three family walks, was distributed to the children on the last day of term and is now also available at outlets in Snaith. Whitchurch, Hampshire Walkers are Welcome – CPRE Countryside Finalists! Walkers are Welcome Whitchurch, Hampshire were delighted to hear that following a successful site visit by the judging panel, they had won through to the final of the CPRE’s Hampshire Countryside Awards 2018. The public now vote for their preferred project….there’s some stiff competition and Whitchurch has a population of less than 5,000, so please support them by voting and spreading the word. http://www.cprehampshire.org.uk/awards/countryside-awards-2018. Find them on Facebook to see just some of the things they are putting in place to help maintain the public rights of way in and around Whitchurch, to promote and extend walking opportunities and how they are involving young people in supporting the town and countryside. The bus walk leaflets produced last autumn with a Partnership Grant from Stagecoach South have extended the range of published walks around Whitchurch and have proved very popular with locals and visitors to the town and the promotional work they have carried out has seen more walking groups visit this year, bringing a boost to the local economy. 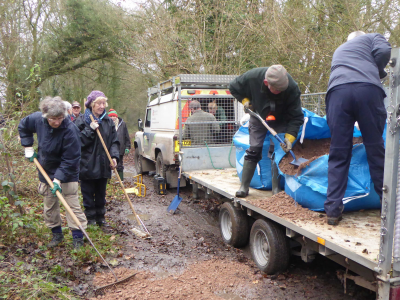 Whitchurch WaW currently have 60 adult volunteers (a core of 30) ably supported by 80 enthusiastic young people from the Scouts and Explorer Scouts, all getting out in to the countryside, repairing footpaths, cutting back vegetation, replacing stiles with gates and litter picking. Since autumn 2015 they have racked up 3,000 hours of volunteer time. Marsden Walkers are Welcome are busy putting the finishing touches to a weekend of walks, talks, film and food. The weekend will run across 15th and 16th of September this year, during the South Pennines Walk and Ride Festival. As well as coinciding with the Walk and Ride Festival, the weekend will see the launch of five redesigned waymarked route leaflets, as well as the launch of The Marsden Film and Television Trail. The Film and TV Trail is a 4-mile circular walk around the village that uncovers some of the locations made famous by film and television companies over the last few decades. The weekend features a great choice of guided walks: from woodland to moorland, from shorter walks to more challenging hikes (the themed ‘Poetry Trail’ creates a loop 10 miles long across beautiful, rugged moorland). As well as the walks (some being family friendly) the weekend comprises of stalls in The Mechanics Institute from a host of community and ‘outdoorsy’ organisations and vendors, plus daytime and evening food as well as evening music and film and bar (of course!). 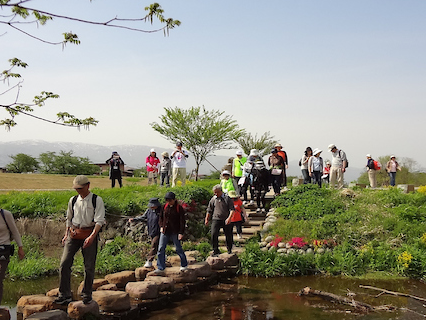 See https://marsdenwalkersarewelcome.org/walking-weekend-2018/ for more information.